Hi everyone, I am looking for a canoe that I can paddle tandem or solo on lakes/flat water and portage and carry camping gear, etc. I am looking at the Keewaydin Combi 16 or maybe a prospector that I can paddle backwards when solo. Has anyone paddled the combi and have any insights or on paddling a prospector backwards? If I added a third person (a child), do you think the combi would be too small to handle the gear and people? I have rented 17 footers for 3 of us but think they're too big to solo paddle probably? I wish I could afford a solo and another canoe but need to try to find one that works for both if possible. The combi is pretty new so hard to find much info about them. I really have no idea since I've never tried it... in the past there have been some pretty negative comments about combis. Your comfort and enjoyment are what counts and maybe it's best to actually try one by contacting Swift. They will allow test-paddles so maybe it might work out. I've read other's reports on paddling 17' canoes solo with some good results (17' Freedom, Winisk)... a larger canoe will be affected by wind more but doable if you can accept some compromise. Two adults and four kids, plus gear in this Winisk... looks dangerous but they lived to tell about it. Thanks frozentripper! Ya that overloaded canoe looks dangerous. I wouldn't want to be in that when any waves pick up. I'm wondering if a 16ft prospector may be a better option than the combi. Flip it around backwards to solo paddle it. I should have mentioned that I can't kneel and paddle so need to be on a seat. Past knee injuries... In this case would I be better off looking at a 16ft vs 17ft or would both still be good options? Most of the time it would be my 8 yr old son and I and I would like to have the solo option too. It would be less often that we would need a third seat. Would you still recommend looking at the 17 Freedom or Winisk? If a prospector or something else, which brands and models would you recommend? Sorry for not providing more info the first time. I have paddled both, the Prospector is the better of the two for sure in my opinion, and based on what you are looking for it will serve better as well. But as mentioned, go for a trial paddle and get a feel for them. Trial it solo so you can see how it will feel when alone since that is the bigger question, paddling tandem always works. I have a winisk in an ultralight layup. Unloaded it can only be paddled if there is no wind. Fully loaded with a kneeling thwart you could be ok. Previously I had an expedition layup winisk and it was less problematic in the wind. Facing a similar question regarding a solo/tandem combo I went with a 15 foot prospector. We use the winisk for long trips and the prospector will be for weekends or when I solo. Thanks gnatwest. Do you find there is much space difference between a 16 footer and 15 footer? 15 foot sounds even easier to handle solo...is it about the same as paddling a 16 ft or a noticeable difference? Is the space still sufficient to hold 2 people and all the gear for a 4 or 5 day trip or longer? Are both of yours Swift? I'm leaning toward Swift but don't know a lot about other brands. We did a demo of 15 and 16 and decided on 15 for more of a solo focus since we already have a big tripping boat. In terms of capacity there is decent room between each seat and the yoke for packs. I expect you would have no issue unless you really over pack. I highly recommend demoing at swift. My winisk and prospector are both from swift. I love my winisk and recommend for serious trippers but as a solo you will likely not be happy. Does anyone have a preference between Nova Craft prospector vs Swift prospector? I see that Kevin Callan and Brad and Wayne Jennings are ambassadors for Nova Craft. Makes me wonder if I should consider checking that out too. Nova Craft's are heavier though and I don't see them being rented as often at least where I have been which may or may not mean something. They have different manufacturing techniques and materials. You see lots of Swift rentals because its the same family as Algonquin Outfitters. My friends have a couple nova crafts some which have been put through the wringer over the years. They are well made. I have had great experiences dealing with Swift at all of their stores and am happy with my canoes. Despite both being called prospector they are not the same design and do not have the same dimensions. Does anyone have a preference between Nova Craft prospector vs Swift prospector? Not that this has anything to do with preference one way or the other, but Nova Craft usually makes their molds from existing original canoes. I know for sure their Pal model was made from a vintage Chestnut cedar and canvas canoe and the Cronje was taken from an existing canoe. Fairly sure their Prospector was too and many of their other models as well. Wenonah's prospector was designed from the ground up by Dave Kruger. I spoke with him about how he designed it and he did a lot of research into producing a form that's a close as possible to the original. That said... even original canoes produced by Chestnut varied over the years. There's a record of somebody restoring an original Chestnut Pal form where they basically found a second form under the form they got from the factory. Apparently Chestnut decided at one point to make the Pal a bit wider to improve stability so its possible to find variance in shape even from molds made from original canoes depending on when the original was produced. Other companies have produced canoes they call Prospectors but that doesn't mean they have much in common with the shape of the Chestnut Prospector. I've looked at the lines and paddled both the Swift and the Nova Craft prospectors. In my opinion the Nova Craft comes much closer to the Chestnut original than the Swift and I liked paddling the NC boat more but its pretty much up to the individual paddler to figure out which they prefer. I'm a Swift fan but not a big fan of the Kee16. My paddling buddy has a Kee16 with a kneeling thwart and I've paddles it both tandem and solo. It's certainly a decent boat but in my opinionated opinion there are better choices. But really we should first ask you how big you are and how much weight your boat needs to carry. I have two combos, a Blackhawk Combi 15.8 from the 1990's and also a Northstar Polaris with three seats (just like the Kee16 Combi). Even though the Poleis is 16'9" it outperforms the Blackhawk both tandem and solo and the Blackhawk is one of the better Combis. I've had other Combis and in my view it's hard to beat the Polaris. In my experience it is more efficient than the Kee16 and also turns much better. That said, the Colden Starfire 15 is also an amazing boat...a really nice solo and also a really nice tandem and it carries quite a load for a 15 footer. You can order one with three seats like the Kee16. Can I ask what you didn't like about the Keewaydin? Having tried a Souris River 16 and Keewaydin 15.5 solo and tandem, I havent noticed too much of a difference apart from the obvious size difference and the Keewaydin feeling more nimble. Thanks daypaddler. I'm 5'11 175lbs and will mostly paddle with my son or a buddy around same size as me. I would like to try solo as well for times when nobody else can go so I'm not stuck at home. My typical trips are up to 5 days and each guy usually has a canoe pack and food barrel and light fishing gear. Not sure how much our gear weighs but most of what we have is lightweight and compact. 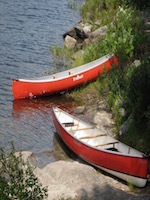 We typically paddle different parts of Algonquin and Kawartha Highlands, Massasauga, we did Wahwashkesh to Island Lake...tried to get to Loon Lake off Island but halted by zero water and a heavy fiberglass canoe...etc. Usually repeating places we like but hoping to explore further out once I have a better canoe I can portage easier. I was looking at prospectors but keep hearing solo they can blow around more and they perform better with heavier loads. I won't be doing any whitewater, just flat. Dadadrop, interesting you mention Souris River 16. I was reading about the Quetico 16 today and it looks like a good tandem/solo canoe. Symmetrical like a prospector but lower bow and stern heights so maybe better in wind? Do you like it and have you solo paddled it much? And the Novacraft Pal seems very similar too. Does anyone have experience with the Pal? When I look at the keewaydin again I notice the stern height is only 17". Seems lower than all the others I'm looking at. Is there a reason for this or could it be an issue? I'm also thinking the keewaydin has less cargo space due to the middle seat. I'm leaning toward a tandem over the keewaydin combi now...but symmetrical so I can still flip it and solo.